Maria Kiesner paints non-existent cities and landscapes – if you consider a cityscape veduta as such. Their archetypes are usually old postcards, a stretch of street that is long-forgotten or has been altered beyond any recognition, a corner post office building, steelworks that used to be modern at the beginning of the 20th century – the focus is always on the whole thing, not details. An impulse always comes from an old image where the eye of the photographer perfectly got the best shot and the colour of sepia makes the portrayed excerpt of reality look quite unreal. The composition is usually the same as in the postcard. What’s lost is the staffage – venduta painters’ favourite motif. In Kiesner’s paintings trees and city parks must follow strict rules of geometry. The time of the day or the season of the year – so easily recognisable in a photograph – here stop being so obvious. A similar thing happens to the source of light, which is invisible, always located somewhere outside the frame of the painting and depriving the figured objects of their illusion of realness. 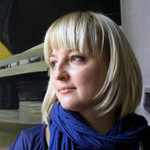 ‘In a world like that time just stops.’ And even if – as she admits herself –she argues with Wróblewski and Dwurnik in her urban and industrial landscapes, even if she completes the roof on “The Unfinished House” of her academic teacher and master, Jarosław Modzelewski, it’s only her who succeeds in staying on the side of undecidability. In a kind of neither/nor state of affairs (At first sight the analogies we want to find for her paintings aren’t that far away from de Chirico. As she confesses herself, she would like to combine drawing with painting the same way he did and – similarly to him – find a painting idiom for a midday siesta. She would also fancy painting deserted Madrid in the middle of a scorching day). The most ordinary and common buildings are rising in the very centre of the composition. They either shoot high up or – in accordance with rules of linear perspective – slide down towards the bottom edge of the canvas, unexpectedly complemented with the excess of monumentality. ‘There and then’ (e.g. postcard cityscapes of old Częstochowa) loses its typical features and with a few strokes of the brush goes to the side of the unreal. Her urban and factory landscapes, suspended in a kind of ‘il y a’, are the figures of melancholy (‘A fixation with geometry is extremely common in all melancholics’). The most recent works inspired by the photos of mediocre American cities are called ‘boring postcards’. Original and existing provincial towns – made unreal and deprived of all their distinctive features – are reduced to simple cubes whose one wall is always contrastingly shadowed, almost black. In Kiesner’s paintings they become a symbolic expression of their own existence, boredom, and ‘a complete suspension and resignation (that is) born of the feeling of impotence, of life that – against strong emotionality – has come to a stop’. What’s trivial and familiar attracts and repulses us. A matt blaze of light and ‘technical’ colours – based on a range of yellow and blue – reveal another aspect of this seemingly bland and uninteresting architecture. They expose familiar strangeness and its terror. Das Unheimliche.